Join neighbors through out the Floyd area in supporting favorite community projects through GiveBigNRV on April 18, 2018. Partnership Floyd is raising funds to complete the new Dodd Creek Trail, constructed over the past year by people like you who want healthy recreation opportunities for Floydians of all ages. The trail is a 1.25 mile loop around Floyd County Recreation Park. Over the past year, the path has been cleared, smoothed, and seeded–with rest benches constructed here and there along the way. Our next plans are for a picnic shelter and fitness stations where walkers may enhance their workout. Your contribution will help make these goals a reality. The Health Fair WILL Happen on Saturday! The 2018 edition of the Health and Wellness Fair will take place Saturday, April 7, from 11 a.m. to 3 p.m. at Floyd County High School. Here is a page with complete information on the Fair. 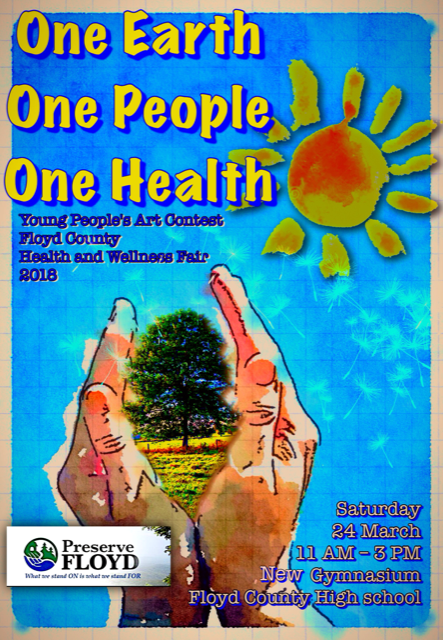 As part of the Floyd County Health and Wellness Fair this year, Preserve Floyd is sponsoring a Young People’s Art Contest on the theme of One Earth, One People, One Health: What does a healthy, balanced web of life look like to you? Due to expected snow and ice on March 24, the Health and Wellness Fair has been POSTPONED. We are searching for a date when we can reschedule. Watch this space for details. The 2018 Floyd County Health & Wellness Fair will take place on Saturday, March 24, 2018 from 11 a.m. to 3 p.m. at the Floyd County High School, in the new gymnasium. Please join us for the second annual FREE for the public community service event. If you wish to exhibit at the Floyd Health and Wellness Fair, it’s now time to apply. The Fair will be returning to Floyd County High School on March 24, 2018, after a successful debut in 2017. Any health & wellness practitioner, educator, or vendor may apply for exhibit space. All applicants will need to have a very strong, legitimate health and wellness focus and be approved by Partnership for Floyd, the fair’s organizer. We have a page with more information on the 2018 Fair, along with information on the guidelines for practitioners and an online application form.